Initially, the Food and Drug Administration FDA had agreed to allow Smucker to issue a “product withdrawal,” pending the results of lab tests. Once pentobarbital contamination was confirmed by the company itself, Smucker agreed to a voluntary recall. Pentobarbital is a chemical sedative used by veterinarians to euthanize animals. The presence of it at any level in a pet food is illegal, and renders the product adulterated under federal law. Gravy Train With Lamb & Rice Chunks, packaged in metal cans with Net WT 13.2 OZ; UPC: 7910005430 on flat case and 7910052543 on cans. Best By range 10 25 19 thru 02 09 2021; Code range: 6299 through 8040, each with the suffix plant number 803. Excluded from Friday’s voluntary recall are a number of products reported previously by Food Safety News to have been withdrawn from the market, based on information obtained directly from the company. FDA has not yet resolved this discrepancy, an agency spokesperson said. Test results are still pending on finished product samples collected by FDA, and the agency is continuing its investigation. Pets should not be fed any of the recalled products. 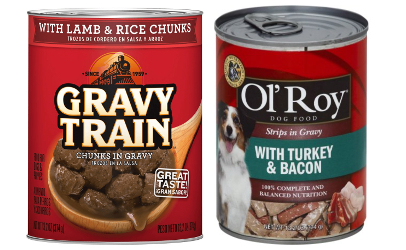 Consumers should safely dispose of the recalled cans of pet food and/or contact the company or the place of purchase for information about returning the products. Pets that consume a food containing pentobarbital can experience drowsiness, dizziness, excitement, loss of balance, nausea, inability to stand and nystagmus, which causes the eyes to move back and forth in a jerky manner. Consuming high levels of pentobarbital can cause coma and death. However, low levels of pentobarbital are unlikely to pose a health risk to pets, according to FDA.